Swim vests for kids help keep young swimmers safe when they frequent the pool. There may be no better way for children to have fun than to jump into the family pool. It's a great way to beat the heat. However, as many parents know, the pool can be fraught with danger. 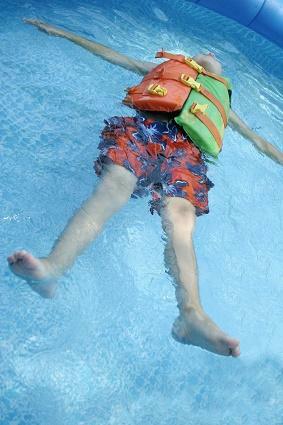 Pool safety is a must, and purchasing swim vests for kids can be an integral part of that safety. These vests help ensure that children stay afloat once they're in the pool, and many parents feel the garments are an expense that is well worth the price, especially since they provide an added sense of security. When it comes to shopping for swim vests for kids, parents have several options. Here are just a few online options. Konfidence Original Jacket: While a bit pricey at $32.95, the makers of this vest claims that it's a viable alternative to water wings and tubes. The vest itself is made from neoprene and features eight removable floats to allow for maximum and flexible buoyancy. The front of this vest is hot pink, the back is a bright, eye-catching yellow. Side Ways Swim Vest: Priced at $26.95, this light blue and green vest features sturdy foam inserts to provide balance for your little ones, and adjustable side cords help ensure that the vest doesn't "ride up". Additionally, you can also find water wings and back floats at the Swim Outlet. Finis Girl's Thermaseal Swim Vests: Made of a quick-drying fabric, this product does not absorb water, and it features an air bubble texture. This texture is said to allow for greater air flow between the vest itself and the body. The result is an easy regulation of body temperature. Prices range between $22.49 and $24.99. The girl's vest has a pink trim with a front and back done in colorful shades of light green, light blue and yellow. The boy's vest, which features the thermaseal material as well, has a red trim with blue and yellow accents. Speedo's Girls' Swim Vest: Available for $21.99, this adorable purple, white and pink vest features a front zipper, so getting in and out of the vest is relatively quick and easy. The swim vest has an additional safety closure to help secure the zipper in the "up" position. Rounding out this style is a UV protection level of 50 plus. Last, if you still can't find the vest you are searching for, try Pool Toy.com. Here, you'll not only find swim vests and flotation devices, you'll also find a section dedicated to special needs children. Not typically offered at other shopping sites, this category may prove immensely beneficial for those with a special needs child. This way, everyone gets to have fun in the pool. Swim vests are a worthy investment for children because these garments allow them to remain safe while having a lot of fun. Moreover, using these vests is a great way to introduce the importance of swimming safety issues. Additionally, there are plenty of different colors and styles to choose from, so the little ones won't lack choices. Toddler floating swimsuits are also available for even younger children. All in all, this product can be a valuable investment in your child's normal swim routine.